I spent a day in Chichester, Sussex, earlier this week. My main objective was the David Jones exhibition at the Pallant House Gallery, but of course I took the opportunity to visit the cathedral and other sites too. I could try to say something original and profound about some of these, but I think my chances of success are slim. Instead, I'll share two little details I noticed and enjoyed, in the hope that any readers this blog might have will enjoy them too. In particular, my eye was drawn to the coat of arms on the balcony; (it doesn't feature on Nash's original plans: see here). It's made, I believe, of Coade stone*; I like the toy fort architectural backdrop. 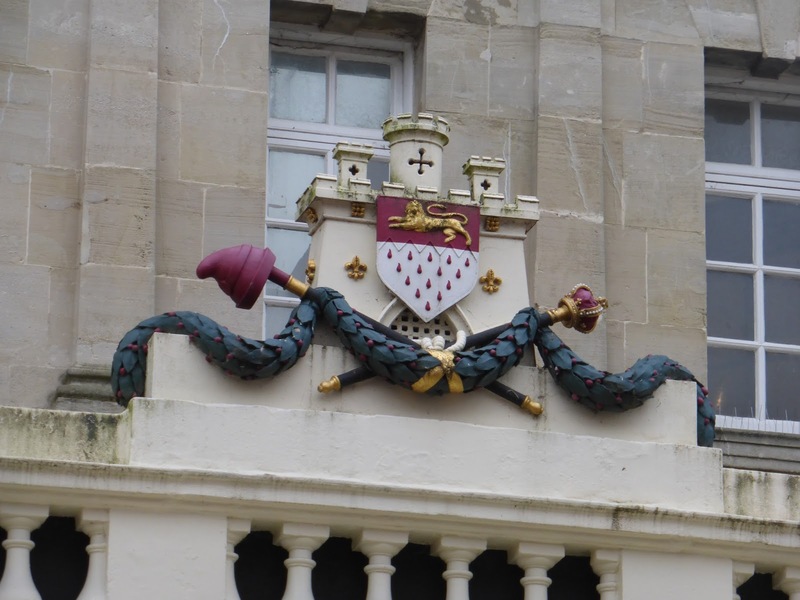 The shield is, as you'd expect, that of Chichester, but I can't find any information about the two staffs, or one sceptre and one staff, crossed at the bottom. 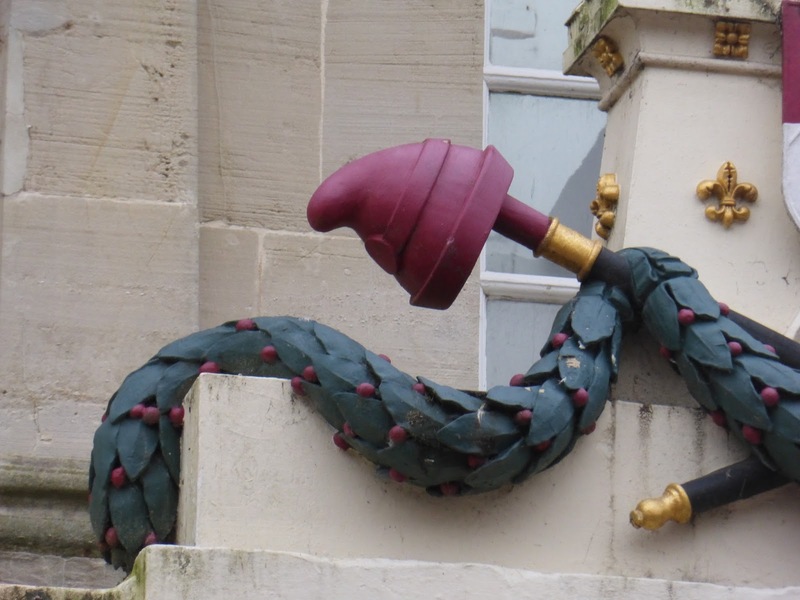 The one on the left has a Phrygian cap hanging on it, realistic enough to momentarily deceive the eye into believing that some Chichestonian merrymaker has hurled his hat into the air, perhaps while celebrating a cricketing victory over local rivals Hampshire, and that it's been dangling there for decades, perhaps centuries. Phrygian caps have of course been symbols of liberty since the French Revolution; they're often known as liberty caps. Why Chichester deems itself to be worthy of this accolade I don't know. Nevertheless, this one gives a welcome whiff of whimsicality to the town centre. 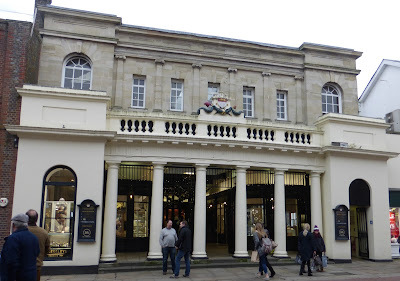 Chichester's main museum is newly constructed and called the Novium; it's well designed and the exhibits well displayed, and it's worth a visit if you're in the city, though there aren't enough top quality artefacts on view to make it worth a detour. One little object that caught my eye, however, is this photograph of the Chichester police force in about 1880. 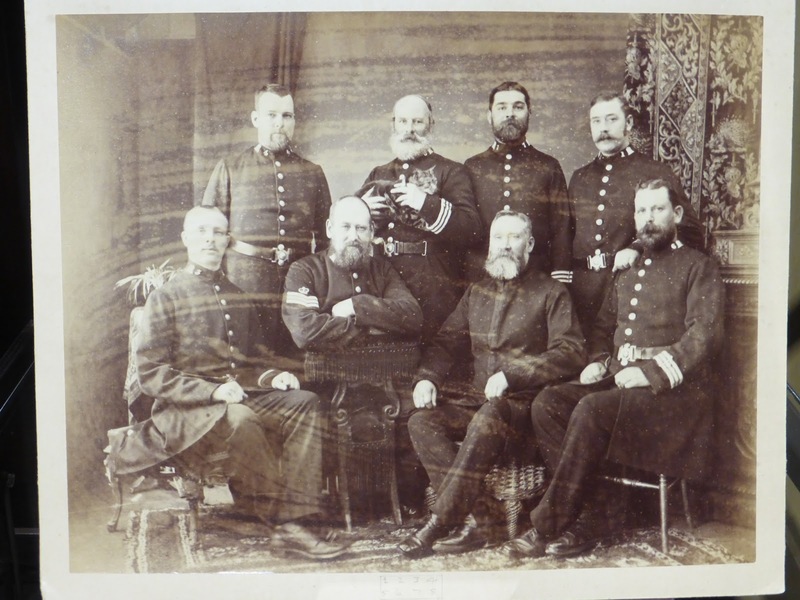 The policeman on the left in the back row was apparently once (one hopes it was only once) found drunk on duty. A contrite but not entirely literate letter from him accompanies the photo. (Might my, or, dear reader, your misdemeanours be the subject of public scrutiny and amusement in a century and a half?) And what a magnificent spectacle their facial hair makes; enough to make a modern hipster give up in despair. 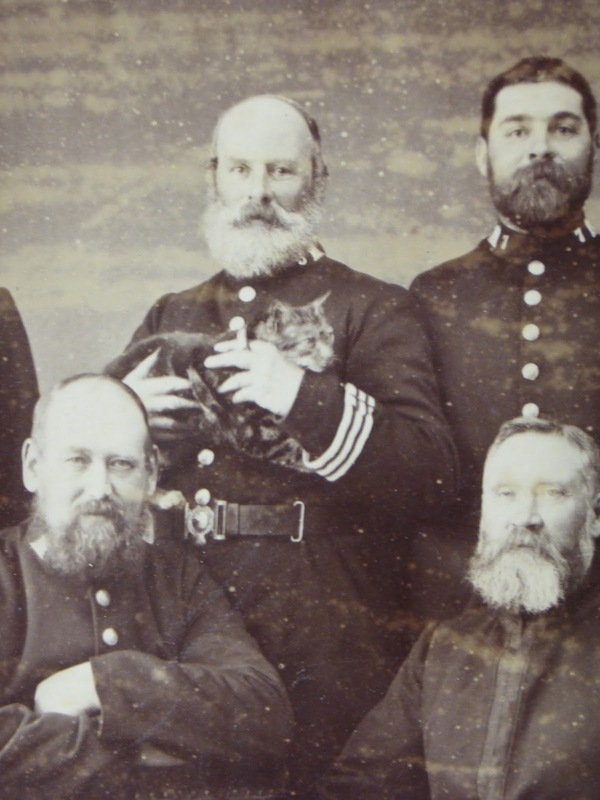 His colleague standing next to him is holding a not particularly impressed looking tabby cat. No doubt he or she was employed to police the rodent population of their station, but I like to think that the bearded chap has picked up his tabby, while the photographer set up his equipment, out of affection. * Coade stone was an artificial stone (in fact it's more like a ceramic) manufactured in the last decades of the 18th century and the first of the 19th. It's named after Eleanor Coade, who ran the business which manufactured it. It was particularly suitable for finely moulded objects intended to be displayed outdoors, and there are at least 650 Coade stone objects still in existence.